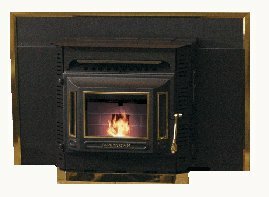 The J1000 produces 38,000 btu. and is rated to heat 1,800 square feet. It has a maximum burn time of thirty eight hours which can be extended to seventy two hours with a hopper extension. This stove has a large choice of options, including two leg styles or a pedestal base, an etched picture in the glass viewing window, and a steel carpet/floor protective plate. See options below. Also included as standard is a brick effect fireback. The burnpot is heavy duty cast iron. Max. Heat Output 38,000 btu. Efficiency Up to 88%. See comments below. Height 24 in: Add 5 in. for steel legs, 5.2 in. for a pedestal, 6.75 in. for cast legs. Window Size Full View door: 15.5 in. by 7.5 in. Pillar door, 11 in. by 7 in. Hopper extension, increasing maximum burn time to 72 hrs. This insert sits outside the fireplace entirely on the hearth. Ideal for placing in front of a tiny fireplace. Small 29 in. by 42 in. Large 35 in. by 50 in. The Jamestown J1000 has no ash pan or ash drawer. Ashes must be scooped out of the ash dump. The figure of 88% overall efficiency seems high and probably relates to an optimal burn rate. Unlike the specs say, the depth is NOT 13.5 inches. it is in fact 21 " deep. I called Jamestown about this and they said the standard way of measuring is without the door and the 2" addition on the back. Clean out ash, clean the heat exchanger, clean inside the firebox. 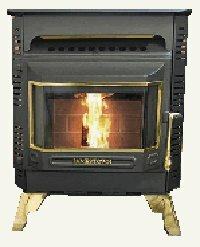 If you would like to leave a review of the Jamestown J1000 pellet stove or fireplace insert, please use the form on the contact page.